① Soak glutinous rice in water for over 3 hours. ③ Wash and clean garlic, jujubes, and peeled chestnut. ④ Fine chop green onion. 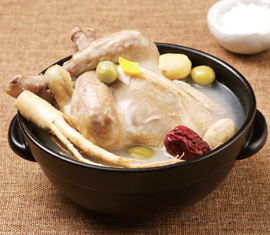 ⑤ Wash and clean the stock ingredients. Put them in a pot of boiling water and cook on medium heat for about 30 minutes.